We had been wanting to do this for some time, but for lack of equipment we couldn't proceed. 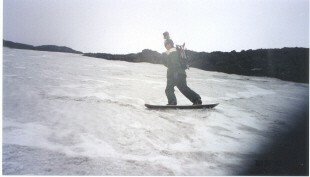 Thanks to Tubbs Snowshoes we were able to plan and commence our journey on June 17th 2000. It was a little late in the season, but we were determined to go. Originally planning for six in our group, only four actually ended up making the journey. 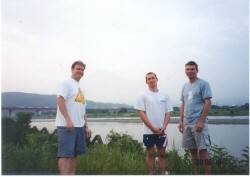 Myself, Jorma Winkler (American) and Christian Neesham (Australian) from Aichi, Matthew Christmann (NZ) from Gifu, and James Shortis (Australian) from Tokyo. We decided to climb more of a north-facing route to hopefully have more snow. We decided starting from the 5th station. We arrived late Friday evening and after lighting off a few fireworks in the beautiful clear moon and starlit night, we had a few hours sleep. Waking up around 4:30 and getting our packs loaded with food, drinks, warm clothes, snowshoes, and of course our snowboards and skis we finally commenced our journey at 5:15 on a wonderfully clear morning, albeit a forecast for rain. Following a bulldozer road up, we encountered an incredibly steep gradient, very little snow, and a lot of insects fully enjoying our sweaty bodies. At around 10:00 the weather started turning for the worse, the clouds gradually surrounding us. Being at around the 8th level, we could see them clearly, although they were still not above us. It was also around this level that we finally encountered enough snow to use our Tubb's Snowshoes and climb straight up to the top. We had encountered various patches of snow further down, but not enough to be of any significance. The snow from the 8th level up was quite slushy and icy, but definitely not traversable with snowshoes and some sort of pole. Two of has ice pick/sticks which helped incredibly. Making our way up the snow took an incredible amount of time. It took about an hour to probably only travel about 100 vertical meters. This was definitely due to the altitude, having already hiked for five hours, and not enough sleep. During our ascension between the 8th and 9th level, the weather also started turning dramatically for the worse. First the clouds, then the snow (actually more like small hail), and then the RAIN! When we finally reached to around the 9th level, the rain was coming down quite hard as well as limiting our visibility. It was at that point that we made a group decision to go no further. Looking up to the top, we couldn't even see the summit because of the cloud coverage. Although, where we were the visibility wasn't so bad but it looked like it would be closing in on us. It was at that point that we took off the snowshoes and put on the snowboards. What took an hour to hike up only took five minutes to do down! Although, we took our time and got some photos and with me and my head-cam video, I was able to get some decent footage. Although, there isn't any video with this write-up at this time, I may be able to describe one of the "better" shots. The video being filmed from the top of my head, you usually can't see me (except for the times I fall), but there was one particular point at which the snow came to an end and the rocks (lava?) begin. It was there you can see me coming to a stop, and then suddenly "no, no, no, no, ohhhh no, %#! @ (expletive). Yes, you may have guessed it, the snow finished and I didn't quite stop, and took a little snowboarding adventure on some nice cinder. My board didn't really appreciate it too much, but it makes for some funny video. Anyway, for anyone who hasn't been up Mt. Fuji, it is pretty much a HUGE cinder cone. It is a dormant volcano, and it doesn't make for the most pretty of hikes being as barren as it is, although the views from up there are outstanding (weather permitting of course). We finally finished our short, but satisfying, snowboarding & skiing (our Tokyo friend was on skis) stint, and made our way back down. We arrived back at the car at about 1:30 or so, having been hiking for about 8 hours (with numberous breaks of course). The rain was still coming down pretty hard, but we cracked open the special Mt. Fuji brew and did an adventure ending toast to Mt. 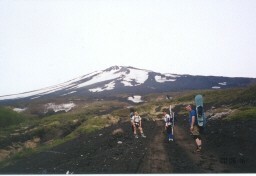 Fuji, ourselves, and of course, Tubb's snowshoes. Of course we vowed to go back again next year when we can snowboard back down to the car! If anyone is interested in next years adventure, we are tenatively planning it for around April or May, depending on the conditions. Also if there are any winter mountain climbers that are interested in doing a few backcountry hikes with us this coming winter, feel free to drop me an e-mail. Sorry, but you should be a pretty decent level of snowboarding/skiing since some of these mountains we go down are quite steep.